Before this week, between Veronica, her mother Mary, and I, we've celebrated Passover in 4 different countries. Mary and Veronica in Ghana, Veronica in Italy, I celebrated in England and we've all observed in the US. Now we can all add the People's Republic of China to that list. And thanks to Mary's suitcase o' matzoh and Grandma Annette's brisket recipe, we were able to do so in style. 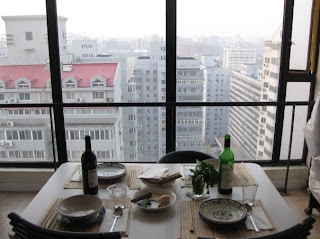 Our first seder was celebrated in our apartment, with an excellent view of the Beijing skyline. Mary invited her friend, Laurence, from one of her tours of Southern China and we were able to share the holiday with an un-initiated. But then, we were all a bit uninitiated - this Seder had a bit of a Chinese twist to it. They picked up some Great Wall wine, as well as some actual French wine - which is quite uncommon here. And we finished the meal with macaroons from the states and rice-gluten pastries. I'm pretty sure I'm going to go sephardic this year and allow rice. It would be pretty hard not to - matzoh and kosher for passover food is REALLY hard to come by. The haggadah we used was a Chinese one that Mary picked up while in Shanghai. It told the story of the Jews of Shanghai at the beginning and often included Mandarin translations of the important prayers. We enjoyed hearty discussion and a few bottles of wine. 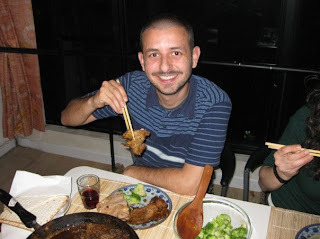 A very nice seder eaten entirely with chopsticks. Except for the soup (clearly). Our second seder was celebrated with the community at Kehillat Beijing. If you are curious, you can visit them online at www.sinogogue.org. This multi-generational community included plenty of US expats and temporary Beijingers from around the world. Apparently a first night seder was hosted by the Chabad house in a different part of town. We haven't been there yet. This seder was much more official, but quite light hearted. The meal included chopped liver, boiled eggs and of course gefilte fish. I'm sure there was a maincourse, but I gorged on those dishes - they really remind of passover back home. Overall the night included plenty of new songs, new melodies, new traditions, new friends and plenty of actual children to run around looking for the afikomen (instead of me and Laurence looking while Veronica laughed at us for not being able to find it). A nice change of pace from day-to-day live in this massive city. Oh, and a lot more matzoh ball soup.